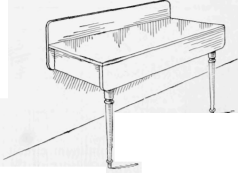 An old table of the extension type, that may have a post broken, can be used against the wall in a kitchen as a work table. If there is a damaged part, that side is removed by sawing the crosspieces of the table in two and attaching: it to the wall against the leaf to the Wall which is turned in a reverse position. - Contributed by A. S. Thomas, Gordon, Can.